6.271. “Moving the Scholarly Book into E-Space.” Université de Pau et des Pays de l'Ardour. February 2019. 6.270. “Ruskin, Credibility, and Power.” Keynote, Ruskin Conference Université de Pau et des Pays de l'Ardour. February 2019. 6.269. “Myths and Icons in Victorian Britain: Types and Shadows.” Université Bordeaux-Montaigne. February 2019. 6.268. “The Power Relationship between Author and Reader in Ruskin and Tennyson.” Seminar de rechereche pluridisciplinaire CLIMAS: Puissance de Mode Mineur. Université Bordeaux-Montaigne. February 2019. 6.267. “What Does It Mean to Illustrate a Book?” Fox-Adler Memorial Lecture. Skidmore College. October 2018. 6.266. “Teaching with the Victorian Web — Successes and Failures. Memorial Colloqium for Linda Peterson. Yale University. May 2016. 6.265. “It’s all Google’s fault; or what happened to hypertext?” Key Ideas and Concepts of the Digital Humanities. Technische Universität Darmstadt. October 2015. 6.264. “Are we writing too much? (or what happens when we don't read hypertextually)” The Future of Text, Google London. November 2014. 6.263. Keynote Speaker Undergraduate Literature and Creative Writing Conference, Susquehanna University, Pennsylvania. March 2014. 6.262. 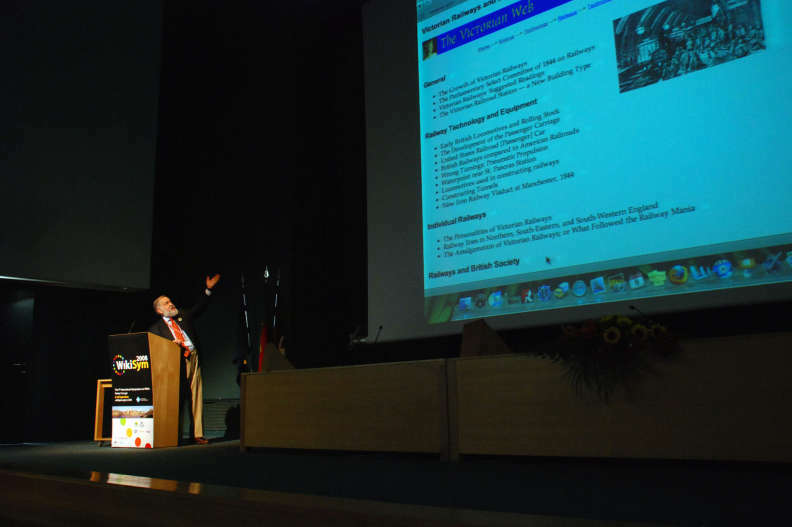 “Twenty-five years of teaching with the Victorian Web — what worked and what didn't.” Keynote for E-Learn 2013 -- World Conference on E-Learning in Corporate, Government, Healthcare, & Higher Education. October 2013. 6.261. “We have always had Mash-ups” Keynote address, Mash 2013. Maastricht, Netherlands. July 2012. 6.260. “Moving the Scholarly Book into E-Space: Successes and Failures” University of Bayreuth, Germany. June 2012. 6.259. “Symbolic (but unreadable texts) in Digital and Analogue Cultures” University of Bayreuth, Germany. June 2012. 6.258. “The Social and Political Importance of the Sutton Dwellings Trust.” Victoria & Albert Museum, London, 19 April 2013. 6.257. "Moving the Scholarly Book into E-space — successes and failures." Book Presence conference. Utrecht, Netherlands. June 2012. 6.256. “The Victorian Web and the Victorian Course Wiki — Comparing the Educational effectiveness of Identical Assignments in Web 1.0 and Web 2.0.” ACM Hypertext 2011. Eindhoven, Netherlands. June 2011. 6.255. “Getting the Paradigm Right: An Introductionto the Victorian Web.” 11th University of Rijeka Scientific Colloquium, Faculty of Humanities and Social Sciences, University of Rijeka, Croatia. June 2011. 6.254. “Is this Hypertext any Good?.” DGSL441 Digital Literature,University of Jyväskylä, Finland. March 2011. 6.253. “What's Happened on the Internet since 2000? Web 2.0, Social Media, and what they have taught us.” Public lecture. University of Jyväskylä, Finland. March 2011. 6.252. “ New Media and Critical Theory: Understanding the Shift from Physical to Digital to Virtual.” DGSL441 Digital Literature, University of Jyväskylä, Finland. March 2011. 6.251. “What Will the Scholarly Book Become in E-space — Experiments with the Victorian Web” Publishing Electronic Literature in Europe. University of Jyväskylä, Finland. March 2011. 6.250. "A brief introduction to Information Technology." Universidad Computense de Madrid. October 2010. 6.249. "Translating the Victorian Web." Universidad Computense de Madrid. October 2010. 6.248. “Virtual Cities, Analogue Virtual Reality, and the Problem of Art.” The Modern City: Images, Formats, Styles Centre of Excellence in Image Studies. Bucharest, Romania. 1 October 2010. 6.247. “What's Happened on the Internet since 2000? Web 2.0, Social Media, and what they have taught us.” National University of Singapore. September 2010. 6.246. “The University Scholars Programme in Transition: A Dialogue with George Landow.” National University of Singapore. September 2010. 6.245. "Successes and Failures: Innovation at Brown University, 1971-2010." Archive and Innovate: 2010 Electronic Literature Organization. Brown University. June 2010. 6.244. "How Much Do Students Have to Know about the Media with Which They Learn?" Workshop on Cyberliteratures in Tel-Aviv University. Tel Aviv University. June 2010. 6.243. Four Keynote lectures, Medien und Kulturbegegnungen: Mediale Netzwerke und gesellschatliche Entwicklungen in den asiatischen Ländern. Universität Bayreuth, Germany. October 2009. "New Media and Critical Theory: Understanding the Shift from Physical to Digital to Virtual"
"Hypertext and New Media on and off the WWW from Vannevar Bush to the Present"
"The Paradigm is More Important than the Purchase: Reconfiguring Teaching and Learning"
"The Politics of New Media: Who Controls the Text"
6.242. Presentation of The Victorian Web, ADE-ADFL Summer Seminar for Department Chairs. Brown University, June 2009. 6.241. "Real Cities, Virtual Cities: Model Railroading as Analogue Virtual Reality." Imatra, Finland. June 2009. Shorter web version of 2.37. 6.240. "Why It's a Bad Idea to Put New Wine in Old Bottles, or How to Think about Digita Media." National University of Singapore. October 2008. 6.239. "When A Wiki Is Not A Wiki: Twenty Years Of The Victorian Web — A USP Project." University Scholars Program, National University of Singapore. October 2008. 6.237. "The Victorian Web and New Forms of Online Book Reviewing." Leslie Center for the Humanities, Dartmouth, College. August 2008. 6.236. "Why It's a Bad Idea to Put New Wine in Old Bottles, or How to Think about Digita Media." Culture of the Digital Media — New Media and Cultural Encounters. Universität Bayreuth, Germany. July 2008. 6.235. "Moving beyond the Hammer; or why the Paradigm is more Important than the Purchase." The New Research Workbench. Porto, Portugal. June 2008. 6.233. "Change the Code, Change the Text: Universities, the Arts, and Information Technology." See What You Think. University of Edinburgh and the Edinburgh College of Art. September 2007. 6.232. "Loss and Gain: Newman in the Context of Victorian Religion." Charles Darwin and Cardinal Newman: Religion, Science, and Technology in the Elgarian Era. Bard College, August 2007. 6.231. "The Victorian Web, 1987-2006 — Experiences with 'the medium is the message' and matters of intellectual property." Yale University Law School. March 2007. 6.229. "Has Scholarship Found Its Muse in E-space?" Johns Hopkins University Press. December 2005. 6.228. First Workshop on Educational Uses of Content in the Digital Age, Berkman Center for Internet and Society, Harvard University. November 2005. 6.227. "Physical Mark, Digital Code — It's Still Writing." Bowling Green, University. November 2005. 6.225. "Is this Hypertext Any Good?" Pontifica Universidade Cathólica de São Paulo, Brazil. October 2005. 6.223. "Hypertext and New Media as Information Technologies." Pontifica Universidade Cathólica de São Paulo, Brazil. October 2005. 6.222. "Ruskin, Praeterita, and Autobiography in an Age of New Media." Annual Mikimoto Ruskin Lecture, Ruskin Programme, University of Lancaster. July 2005. 6.221. "What happens to the scholarly book in e-space?" Humanities Informatics Lecture Series. The Melbern G. Glasscock Center for Humanities Research, Texas A&M University. February 2005. 6.220. "Discovering the Past: The Rise of Historicism in 19th-century Art and Culture." Golden Inspiration: Revivals in Jewelry from 1800 to the Present. Symposium accompanying The Castellani and Italian Archeological Jewelry exhibition. Bard Graduate Center, New York City. January 2005. 6.219. 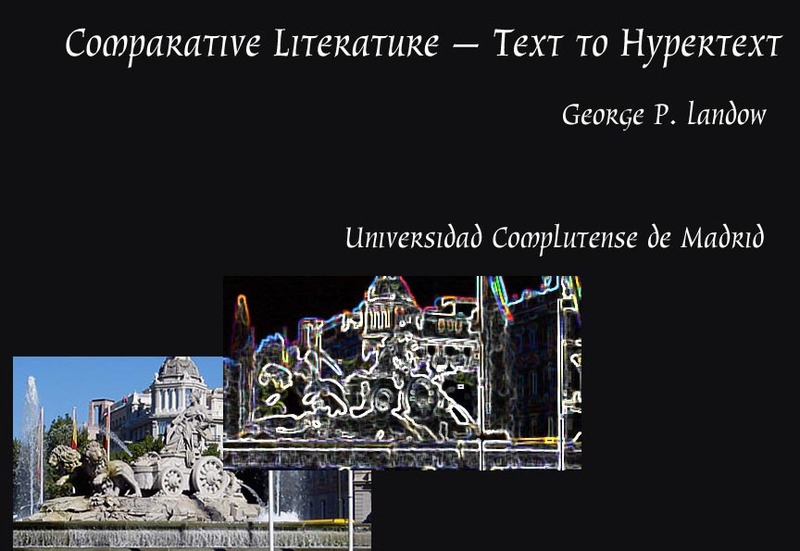 "Hypertext as Paratext." I Dintorini del Testo: Approcci alle Perfiferie del Libro. Scuola Speciale per Archivisti e Bibliotecari. Rome and Bologna, November 2004. 6.218. "A brief introduction to the Victorian Web." Online Resources for the Humanities: Interdisciplinary Perspectives. International seminar at Brown University, May 2004. 6.217. "What is Quality in Hypertext?" Under Construction: Literature digitales i aproximacions teòriques. Universitat Oberta de Catalunya, Barcelona. April 2004 [Photographs from the conference]. 6.216. "Is Hypertext Fiction Possible? (or Does the Link Privilege Poetry?) E-fest 2004. Brown University. February 2004. 6.215 "Learning to Read, Write, and Enjoy Hypertext." E-narrative 5. Cambridge, May 2003. 6.214 "Hypernarrative." "Hypertext. Narrative. Art. Tech." Joint session of E-narrative 5 and Boston Cyberarts Festival. Boston, May 2003. 6.213 "The aesthetics of nionfiction." Inaugural celebration for the opening of Nine Billion, AS220, Providence. March 2003. 6.212 "The Hypertextual Paradigm in Humanities Scholarship and Education" [Keynote address]. Blue Ridge International Conference on the Humanities and the Arts. April 2002. 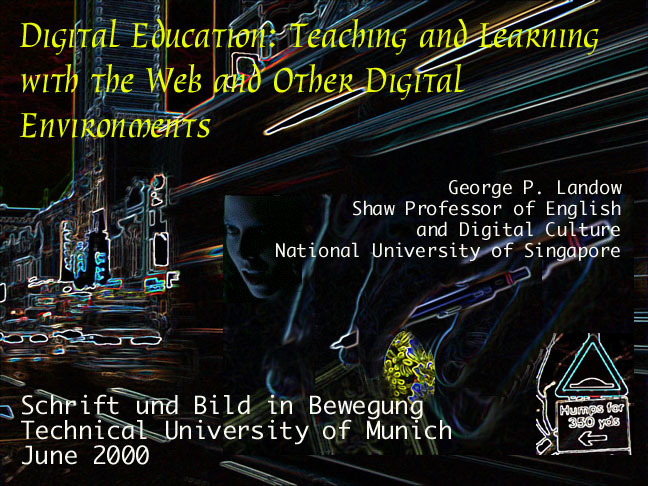 6.211 "Networked Information technologies and New Paradignms for Education." University of Hong Kong, December 2001. 6.210 "'The "Voices of the Landless' Project: Hypertext Theory and Practice." Keynote Address. Critical Theory and Cultural Studies/ Hispanic and Latin American Studies, University of Nottingham. September 2001. 6.208. "Asian Diasporas, Information Technologies, and Virtual Identities." Keynote address. Asian Diasporas and Cultures: Globalisation, Hybridity, Intertextuality. Singapore. September 2001. 6.207. "Victorianism as Print Culture, The Victorian Web, and the Wonders of Hypertext." Locating the Victorians, London. July 2001 [presentation]. 6.206. "Teaching and Learning with the Web." Full-day tutorial. WWW10, Hong Kong, China. May 2001. 6.204. "Extending the Virtual Museum: Integrating the Museum with Other Forms of Websites" (Closing plenary panel). Museums and the Web 2001, Seattle, March 2001. [Web presentation]. 6.203. "Linking the Victorians — an Introduction to the Victorian Web." Modern Language Association, Washington, D. C., December 2000. Web presentation]. 6.202. "The University Scholars Programme at the National University of Singapore — Hypertext as Paradigm and Educational Innovation." Ministry of University Affairs of Thailand, Bangkok. December 2000. 6.201. "Educational Innovation and Hypertext Theory: The University Scholars Programme, National University of Singapore." Innovations. Institutt for Medier og Kommunikasjon, University of Oslo, Oslo, Norway. October 2000. [Opening screen of talk]. 6.200. "Information Technology Doesn't Begin with Computers: Lessons for Multimedia Designers." Institutt for Medier og Kommunikasjon, University of Oslo, Norway. October 2000. 6.198. "Derrida, Deconstruction, and Digitalculture" Derrida and Deconstruction. National University of Singapore. September 2000 [Opening screen of talk]. 6.197. "What Happens to the Scholarly Book in Electronic Space?" Moving Text into E-Space [conference and post-conference website]. National University of Singapore. July 2000. 6.194 "Jane Eyre: Teaching with the Web" Stuck with the Canon?. Brown University Workshop for Secondary School Teachers. Autumn, 1999. 6.193 "What is Virtuality in E-Space?" VirtuallY2K. Brown University. Autumn, 1999. 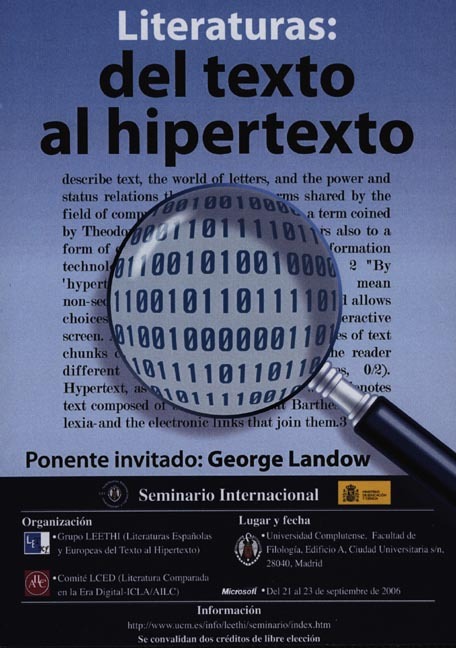 6.184 "Digital IT and Education: Using Hypertext to Teach and Learn." Universitat Oberta de Catalunya, Barcelona. March 1999. 6.183 "Seminar for Teachers at a Virtual University on Hypertext 2.0." Universitat Oberta de Catalunya, Barcelona. March 1999. 6.182 "What Web Learning Has to Offer the NUS ore Curriculum." Professorial lecture, National University of Singapore. March 1999. 6.181 "Singapore Literature on the Web." National Institute of Education. Singapore. February 1999. 6.180 "What Do You Have to Know to Teach and Learn with the Web?" National University of Singapore. January 1999. 6.179 "How Does One Make Sense in Hypertext? or Reading in E-Space." Creating Sense: Texts and Realities, Singapore. September 1998. 6.178 lectures, NEH Institute for Secondary School Teachers, Illinois State University. July 1998. 6.177 "The New Binary: Content and Distance." Keynote address, E-Merging: Content, Technology and Distance, the New School for Social Research, New York City, April 1998. 6.176 "Hypertext and the Humanities: Theory and Practice." Lecture and Workshop, University of Nebraska, Lincoln, April 1998. 6.174 Performing Fiction and Nonfiction in E-Space: Readers and Writers in the Docuverse." University of Sussex. January 1998. 6.173 lecture, Cognitive Theories of Intertextuality. Porter Institute of Semiotics, U. of Tel Aviv, Israel. December 1997. 6.172 "Virtual Text, Virtual Communities." The Virtual Community: a Challenge for the Next Millennium Instituto Universitario di Linguie Moderne (IULM), Milan, Italy, November 1997. 6.171 "Digital Text, Hypertext, and the New Library." University of Washington Library, October 1997. 6.170 "Reading and Writing the New Digital Text." Voice, Text, and Hypertext at the Millennium, University of Washington, October 1997. 6.169. "Hypertext and the Idea of an Electronic University." Keynote adress, Envisioning the Future: Creating the Humanities "Classroom" of the 21st Century, Michigan State University, September 1997. 6.165 "Learning with Digital Word and Image" (keynote lecture).Multimedia and Academic Communication (Oslo/Harare/Brown project), University of Zimbabwe, Harare, August 1997. 6.164 "lecture," Mapping Spaces/Crossing Boundaries (Hewlett Faculty Seminar), Vassar College, May 1997. 6.163 "What's the Computer Doing to the Novel? Hypertext and Fiction." University of South Alabama, May 1997. 6.162 "Reconfiguring Education with Digital Word and Digital Image." University of South Alabama, May 1997. 6.161 Full-day workshop with Daniel M. Russell on hypertext in education. Hypertext '97, Southampton, U. K., April 1997. 6.160 "Literary Theory and Digital Culture," University of Oslo, March 1997. 6.159 "Performing the Digital Text — with the World Wide Web (? )", Getty Research Institute, Santa Monica, California March 1997. 6.158 "The Rhetoric of Teaching with Hypermedia." Multimedia: Dramaturgy, Pedagogics and Innovation, University of Oslo, December 1996. 6.157 "Digitizing Theory," Internet e le muse. Le nuove tecnologie nella ricerca e nella didattica delle discipline umanistiche, Centro Linguistico, Instituto Universitario di Linguie Moderne (IULM), Milan, Italy, November 1996. 6.156 "Through the Digital Looking Glass." Centennial Meeting of the Lewis Carroll Society, Brown University, November 1996. 6.155 "Hypertext and Literary Education," European Union Humanities II Project, [Broadcast via satellite to the Universities of Aarhus, Bergen, Granada, Groeningen, and Vienna] October 1996. 6.154 "Everything You Wanted to Know about Hypertext at Brown in Five Minutes," Unspeakable Practices III. Brown University, October 1996. 6.153 "Hypertext as Collage Writing." The New Culture of the Digital Word. University of Virginia, October 1996. 6.152 Hypertext workshop and lectures for Advanced Technology and Cultural Dissidence. Arteleku, San Sebastian, Spain. August 1996. 6.151 "Hypertext and Narrativity." Culture Space, Sign: International Conference of Semiotics. Amsterdam, August 1996. 6.150 "Cyborg Semiotics" (Workshop) Culture Space, Sign: International Conference of Semiotics. Amsterdam, August 1996. 6.149 "Redefining the Differences between Principal and Subsidiary Texts in Electronic Scholarly Editions." DRH 96: Digital Resources for the Humanities, Somerville College, Oxford, England, June 1996. 6.148 "Hypertext, Scholarly Annotation, and the Electronic Edition." ACH-ALLH. Bergen Norway, June 1996. 6.147 Workshop: "Creating Educational Hypertexts." Hoegskolen i Bergen, Bergen, Norway, June 1996. 6.146 "The Rhetoric and Stylistics of Writing Hypertext." Hoegskolen i Bergen, Bergen, Norway, June 1996. 6.145 "Hypertext, World Wide Web and the Internet." Institutt for medier og kommunikasjon (IMK), University of Oslo, Norway, June 1996. 6.144 "Contextualizing Texts, or Inventing the New Writing — What is the Role of Hypermedia in Education?" Language, Literature, and Society conference. Loyola College, Maryland. April 1996. 6.143 "The Process of Discovery: Hypertext and Scholarship." Panel at Hypertext'96: The Docuverse Takes Form, Washington, D. C., March 1996. 6.142 (with Daniel M. Russell) "Educational Uses of Hypertext: From Design to the Classroom." Full-day course, Hypertext'96: The Docuverse Takes Form, Washington, D. C., March 1996. 6.141 "Hypertext and Contemporary Literary Theory." George Washington University, March 1996. 6.140 Keynote Address. Hypertext Symposium. George Washington University, March 1996. 6.139 "The Cyberbook: Books and Cyberspace" (with William Mitchell). Communications Forum. MIT, February 1996. 6.138 "Hypertext as Collage Writing and the New Genres." MIT, February 1996. 6.137 "Teaching the Victorians with the World Wide Web." MIT, February 1996. 6.136. "An Introduction to Hypertext for the Bible Scholar." Endowment for Biblical Studies Conference. Hilton Head, January 1996. 6.135. "Digital Matters: What Hypertext and Critical Theory Has to Offer the World of Business." University of Rhode Island. Kingston, December 1995. 6.134. "The World Wide Web and Internet Basics," National Association of College Broadcasters. Providence, November 1995. 6.133. "Reconfiguring Teaching and Education with Digital World and Digital Image." Sacred Heart University, November 1995. 6.132. "What Will We Do After the Book?" Stanford University, October 1995. 6.131 "Hypertext as Collage." The Digital Dialectic. — - Art Center College of Art and Design, Pasadena, August 1995. 6.129 "Hypertext and Graphic Design." Rhode Island School of Design, May 1995. 6.128. "Literary Education, Theory, and Scholarship and the New Digital Media," Centro di Richerche Informatiche per i Beni Culturali, Scuola Normale Superiore, Pisa. April 1995. 6.127. "Tintoretto, Ruskin, and Pre-Raphaelite Spiritualized Realism," University of Venice. March 1995. 6.126. "Hypertext as Collage Writing." L'Editoria ipermediale e le arti: Sistemi e modelli cognitivi. Conference, Venice. March 1995. 6.125. "An Introduction to Storyspace." L'Editoria ipermedialee le arti: Sistemi e modelli cognitivi. Conference, Venice. March 1995. 6.124. "Hypermedia and Poststructuralism." Österreiches Forschungsinstitut für Artificial Intelligence, Vienna. March 1995. 6.123. "Hypertext as Collage Writing," Plenary address. Semiotics and the Media / Semiotics of the Media Conference, Kassel, Germany. March 1995. 6.122. "Writing for Hypertext." Influences 7. Designing for Interactive Media. Marshall University, Huntington, West Virginia, March 1995. 6.121. "Beyond the Book, Towards Hypertext," Oxford University, February 1995. 6.120 "Hypertext and Collage,"Keynote address, Theory and Computing Culture. Centre for English Studies, London University. January 1995. 6.119 "Educational Hypertext and the Digital Library," Keynote address, Hypertext in Education, University of Canterbury, January 1995. 6.118 "New Ways of Reading and Writing in the Electronic Environment: New Styles, New Genres, New Rhetorics," Richard Goodman Trust Memorial Lecture. University of Brighton. (U.K.), January 1995. 6. 117 "Hypertext and Genre." Umberto Eco's Future of the Book conference, San Marino (Italy), August 1994. 6.116 (with Daniel M. Russell) "Teaching with Hypertext," Full-day workshop, Ed-Media '94, Vancouver, British Columbia, June 1994. 6.115 "From Read-only Resources to Collaborative Learning Environments: The Experience of High-end and Low-end Hypertext Systems. "Keynote address. Hypermedia in Vaasa, '94. Vaasa, Finland, June 1994. 6.114 "Hypertext and Literary Theory." CREDO, Université Charles DeGaulle (Lille lll), Lille, France. 6.113 "Hypercriticism, Literature, and the Academy." Beyond Gutenberg: Hypertext and the Future of the Humanities. Yale University. May 1994. 6.112 "Reconfiguring Reading and Learning with Hypertext." University of California, Berkeley, April 1994. 6.111 "Designing Hypermedia Documents," full-day workshop at EP'94 [Electronic Publishing '94], Darmstadt, April 1994. 6.107 "Educational Hypertext." C-SALT, University of Lancaster, January 1994. 6.105 "Writing at the Edge: What Experimental Writing Has to Tell Hypertext Authors and Designers," Keynote Address, Hypertext '93. Seattle, November 1993. 6.104 "Axial versus Network Structure," Structure in Hypertext, Hypertext'93. Seattle, November 1993. 6.103 (with Daniel M. Russell) "Teaching with Hypertext," Full-day workshop, Hypertext'93. Seattle, November 1993. 6.102 "Electronic Book or Computer Hypertext — Their Implications for Scholarly Editing," Association for Documentary Editing, Philadelphia, October 1993. 6.101 "Electric Writing," Keynote address, Compters and Writing Conference, Ann Arbor, May 1993. 6.100 "Hypertext and Journalism," Niemann Foundation, Harvard University, May 1993. 6.99 John Ruskin, Ruskin Reconsidered, Phoenix, April 1993. 6.98 "Simulated Landscapes and Opaque Nature," Recent Approaches to the Natural and Urban Landscape, Brown Art Department Symposium, March 1993. 6.97 "The Future of Humanities Computing." University of Virgina, Charlottesville, March 1993. 6.96 "John Ruskin, Prophet of the Eye" Phoenix Art Museum, March 1993. 6.95 "Looking at Art with Ruskin," Phoenix Art Museum, March 1993. 6.94 (with Daniel M. Russell) "Teaching with Hypertext," Full-day workshop, ECHT92, Milan, December 1992. 6.93 (with Paul Kahn) "Where's the Hypertext? The Dickens Web as a System-lndependent Hypertext," ECHT92, Milan, December 1992. 6.92. "HyperBarthes, Electr(on)ic Derrida," Vassar College, October 1992. 6.91 "History, Sacred History, and the Infinite Moment in Victorian Landscape Painting," Landscape and the Victorian Imagination, Yale Center for British Art, September 1992. 6.90 "Navigation and Orientation in Hypertext," Hypertext'91, Austin, Texas. 6.89 "Hypertext and Contemporary Literary Theory," Macademia '91. Philadelphia, June 1991. 6.88 "Hypertext and Collaborative Learning: The Experience of Intermedia." The Social Creation of Knowledge: Multimedia and Information Technologies in the University, MIT Conference, April 1991. 6.87 "Collaborative Writing and Student-Created Hypertext: the Experience of the Soyinka Web and Context34" Brown Computing in the Humanities Users Group (CHUG), February 1991. 6.86 "Hypertext, Education, and Literary Theory" Institutt for Medier og Kommunikasjon, University of Oslo, Oslo, Norway, November 1990. 6.85 "Linking Words and Images. The Experience of Intermedia," NAVFs Edb-Senter for Humanistisk Forskning og Kunsthistorisk Institut, University of Bergen, Bergen, Norway, November, 1990. 6.84 "The Hypertext Educational Textbook — Implications for Reader and Writer," Elektroniske bøker — Multimedia oppslagsverk [Electronic Books — Multimedia Reference Works], Bergen, Norway, November 1990. 6.83 "Emblematic Relations: Contextualization of Emblem Literature with Intermedia," International Emblem Conference, Glasgow, August 1990. 6.83 "Reading, Writing, and Learning with the Electronic Book," Faculté de Psychologie et de Science de l'Education, University of Geneva, June 1990. 6.82 "The Rhetoric and Stylistics of Hypermedia," Faculté de Psychologie et de Science de l'Education, University of Geneva, June 1990. 6.81 "Teaching and Learning with Hypertext: The Example of IRIS Intermedia," Institut für Informatik, University of Zürich, June 1990. 6.80 "The Rhetoric and Stylistics of Hypermedia," Institut für Informatik, University of Zürich, June 1990. 6.79 "Virtual Texts, Virtual Authors, and Computing in the Humanities. "Computers in the Humanities: Methods and Applications, ALLC-ACH 90 [Association of Literary and Linguistic Computing-Association of Computing in the Humanities], Siegen, Germany, June 1990. 6.77 "Teaching with Intermedia." Hypermedia Systems and Instructional Goals, American Education Research Association, Boston, Massacusetts, April 1990. 6.76 "Barthes, Hypertext, and the Politics of the Text," Modern Language Asssociation, Washington, D. C., December 1989. 6.75 "Teaching with Hypertext," University of Notre Dame, December 1989. 6.74 "Blending the Codes: Victorian Mixed Media." Keynote address, Victorians Institute 1989, Virginia Commonwealth University, 20-21 October 1989. 6.73 "Reconfiguring the Canon and Curriculum with Hypertext," Literacy on Line: Computers and Literacy: The Promise (and Peril) of Reading, Writing, and Teaching with Electronic Texts (the Sixteenth Alabama Symposium on English and American Literature), University of Alabama, 26-28 October 1989. 6.72 "Hypertext: the Convergence of Critical Theory and Technology," Bucknell University, September 1989. 6.71" Educational Hypertext," NATO Advanced Research Workshop: Designing Hypertext/Hypermedia For Learning, Tübingen, Germany, July 1989. 6.70 Advanced Hypertext Workshop, Macademia '89, Brown University, May 1989. 6.69 "Linking the Continents of Knowledge with Intermedia," Macademia '89, Brown University, May 1989. 6.68 "Reconfiguring the Canon and Curriculum with Hypertext," Vassar College, April 1989. 6.67 "Educational Hypertext," American Education Research Association, San Francisco, California, March 1989. 6.66 "Reconfiguring the Canon and Curriculum with Hypertext," The New University: Higher Education and the Authority of Knowledge, a Ford-Foundation-sponsored conference, Brooklyn College, March 1989. 6.65 "Linking the Continents of Knowledge with Intermedia," NERComp, Brown University, February 1989. 6.64 "Linking the Continents of Knowledge with Computers," Review Club, Providence, Rhode Island, January 1989. 6.63 "The Rhetoric and Stylistics of Hypertext: The Experience of the Brown Intermedia Project," Modern Language Asssociation, New Orleans, December 1988. 6.62 "Barthes, Hypertext, and the Politics of the Text" Brown University CHUG (Computing in the Humanities Users Group), Providence, RI, November 1988. 6.61 "Changing Texts, Changing Readers: Teaching the Humanities with Intermedia," Princeton University, November 1988. 6.60 "Reader's Text or Writer's Text: The Politics of Hypertext," EDUCOM '88, Washington, D.C., October 1988. 6.59 "Linking the Continents of Knowledge," Forum at the dedication of the Thomas J. Watson Center for Information Technology, Brown University, Octover 1988. 6.58 "Collaborative Work and Collaborative Learning with Intermedia," A Critical Examination of Technology in Higher Education, Sloan Foundation-sponsored conference at Dartmouth College, October 1988. 6.57 "Teaching English Literature with Hypertext," Northeast Modern Language Association Convention, Providence, Rhode Island, March 1988. 6.56 Panelist, Language and Literature section, Do humanists change the way they teach after doing research on a microcomputer? Conference on Academic Computing, Princeton University, March 1988. 6.55 "Assignments in Hypertext," Annenberg/Perseus Conference, Harvard University, March 1988. 6.54 "Hypertext in Teaching and Criticism," English Department Colloquium, Brown University, Providence, R. I., February 1988. 6.53 "Using Hypertext to Teach an English Literature Course," Computers and the Humanities, North East Modern Language Association, Providence, R. I., March 1988. 6.52 "Teaching Literature and Critical Thinking with Hypermedia," The Workstation in Education, New England Regional Computing Program (NERCOMP), Session at Babson College, Wellesley, Massachusetts, February 1988. 6.51 "The Female Sage and Florence Nightingale's Cassandra,"The Female Sage, Modern Language Association Annual meeting, San Francisco, December 1987. 6.50 "Reading Pre-Raphaelite Painting," Re-evaluating Pre-Raphaelitism, Modern Language Association Annual meeting, San Francisco, December 1987. 6.49 "Relationally Encoded Links and the Rhetoric of Hypertext," Hypertext '87, University of North Carolina, Chapel Hill, November 1987. 6.48 "Thinking about Literature: Influences and Insights," Enhancing Higher Education through Microcomputers. Georgetown University, Washington, D. C., November 1987. 6.47 "CONTEXT32: Using Intermedia to Teach a Survey of English of English Literature." Indiana University, October 1987. 6.46 "Computing in the Teaching of Literature," Computing Innovation at Brown and its Impact on Silicon Valley, San Francisco, September 1987. 6.45 "Tolkien's Illustrations for The Hobbit and the Tradition of British Fantasy Illustration." Haggerty Museum of Art, Marquette University, September 1987. 6.44 "Emblem and Emblematic in the Art of the Victorian Sage." The European Emblem, Glasgow, Scotland, August 1987. 6.43 "Context32: Using Hypermedia to Teach Literature." 1987 IBM Academic Information Systems University AEP Conference, Boston, June 1987. 6.42 "An Introduction to the IRIS Intermedia Project." Joint meeting of Harvard University Perseus project and Brown University CHUG (Computing in the Humanities Users Group), Providence, RI, April 1987. 6.41 Discussant, "John Ruskin, New Visions and Revisions." College Art Association, Boston, February 1987. 6.40 "Ruskin and Morris." Morris and Art. Modern Language Association. New York, December 1986. 6.39 "Computers and Teaching the Humanities." Tulane University, December 1986. 6.38 "Images of Assurance and Images of Crisis: Representations of Lighthouses and Shipwrecks." Newport Historical Society, Newport, Rhode Island, July 1986. 6.37 "The Art of Labor and the Labor of Art." Northeast Victorian Studies Association, British Art Center, Yale University, April 1986. 6.36 "Teaching the Dickens out of a Computer: English Literature on the Scholar's Workstation." New Technology in Higher Education Lecture Series, Brown University, April 1986. 6.35 "Spinning a Web of Scholarly Work: A Survey of English Literature as Enhanced by the Intermedia System." IBM/University AEP Conference, San Diego, California, April 1986. 6.34 "Tennyson and Browning Justify God's Way to Man." Victorian Revisions of the Epic, Modern Language Association, Chicago, December 1985. 6.33 "Carlyle, the Inventor of a Genre." Victorian Prose in the Classroom. Modern Language Association, Chicago, December 1985. 6.32 "Images of Assurance and Images of Crisis: Representations of Lighthouses and Shipwrecks." Museum of Rhode Island History, November 1985. 6.31 "The Iconography of Lighthouses." Year of the Ocean festivities, U. R. I. Bay Campus, Narragansett, R. I., June 1985. 6.30 "Computers and Imagination: English." Commencement Forum, Brown University, May 1985. 6.29 "Education for the Gifted in Providence Public Schools, Grades 1-8." Portsmouth School Department (members of Newport and Tiverton systems attending), April 1985. 6.27 "Biblical Typology and Scholarly Research." Professor Frank Turner's NEH Summer Seminar for College Teachers, Yale University, July 1984. 6.26 "Ruskin the Sage." John Ruskin Symposium, British Art Center, Yale University, September 1983. 6.25 "Images of Rome in Victorian Painting." Conference on the Victorians and Rome, City University of New York, April 1983. 6.24 "Victorian Romans, Roman Victorians, and the Victorian Idea of Rome." English Institute, Harvard University, August 1982. 6.23 "Sages and Satirists: A Generic Approach to Victorian Non-Fiction," University of Maryland, April 1982. 6.22 "Sages and Satirists: A Generic Approach to Victorian Non-Fiction," Victorian Literature and Society series, University of Kentucky, March 1982. 6.20 "The Iconology of Shipwreck in American Painting." Conference on New England and the Sea, University of Rhode Island, July 1980. 6.19 "The Uses of the Annunciation Scene by the Pre-Raphaelite Brotherhood." Conference on Victorian Medievalism, City University of New York, April 1980. 6.18 "Hogarth and Nineteenth-Century English Painting." University of Rhode Island, April 1980. 6.17 Chaired seminar on biblical typology in Victorian literature, Modern Language Association, December 1979. 6.16 "An Introduction to Pre-Raphaelite Painting." Main Victorian Section, Modern Language Association, December 1979. 6.15 "The Sage: A Theory of Nonfiction from Carlyle to Mailer." University of Michigan, October 1979. 6.14 "The Secular Sage: a Romantic Tradition in Prose from Carlyle to Mailer." Annual Carl Grabo Memorial Lecture, University of New Mexico, March 1979. 6.13 "Bruising the Serpent's Head: Typological Symbolism in Victorian Poetry." Main Victorian Section, Modern Language Association, December 1978. 6.12 "The King of the Golden River: Its Relation to Ruskin's Thought and Nineteenth-Century Fantasy Literature." University of Massachusetts, November 1978. 6.11 "Iconography as Practical Aesthetics — — the Example of Pre-Raphaelitism." University of Pennsylvania, March 1978. 6.10 "Visual and Verbal Autobiography." Modern Language Association, December 1977. 6.9 " Iconography and Point of View in Painting and Literature." Midwest Modern Language Association, October 1977. See 4.28. 6.8 "The Prefiguring Day: Rossetti and Typological Symbolism." Yale University lecture series, Rossetti and the Double Work of Art, October 1976. See 4.29. 6.7 Chaired autobiography section, Modern Language Association, December 1975. 6.6 "Victorian Rainbows: Problematic Images of Problematic Nature." Modern Language Association, December 1975. See 2.3. 6.5 "There Began to be a Great Talking about the Fine Arts." The University of Minnesota-National Endowment for the Humanities lecture series, The Mind and Art of Victorian England, October 1975. See 2.1. 6.4 "Moses Striking the Rock: An Example of Typological Symbolism in Victorian Poetry." Princeton University Conference on typology, April 1975. See 2.2. 6.3 "Every Man is an Island — Some Nineteenth-Century Versions of Robinson Crusoe." Northeastern Modern Language Association, April 1975. 6.2 "<Praeterita, Visionary Structure, and the Problem of Autobiography." Modern Language Association, December 1973. 6.1 "Structuralism and Romantic Imagery." Northeastern Modern Language Association, April 1973.